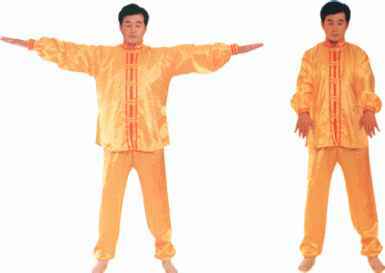 When reaching the lower abdomen area, immediately lift the hands up to the chest and He Shi Figure 1-5 . When doing Heshi, fingers and the base of the palms are pressed against each other, with a hollow space between the palms. Hold the elbows up, with the forearms forming a straight line. 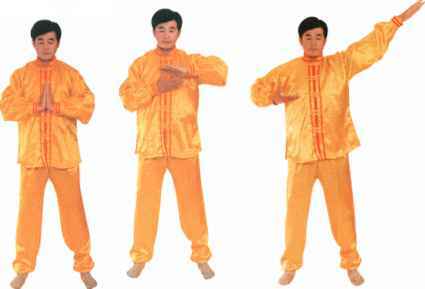 Keep hands in the lotus posture, except doing Heshi and Jieyin, this is the same for the following exercises . Separate the hands at the chest and extend them toward the sides of the body forming a straight line with the shoulders. Gradually stretch the entire body. Push the head upward, press the feet downward, straighten the two hands forcefully at the sides and stretch out in four directions as Fig. 1-10 for 23 seconds. Immediately release the entire body and Heshi as shown in Fig. 1-5 .